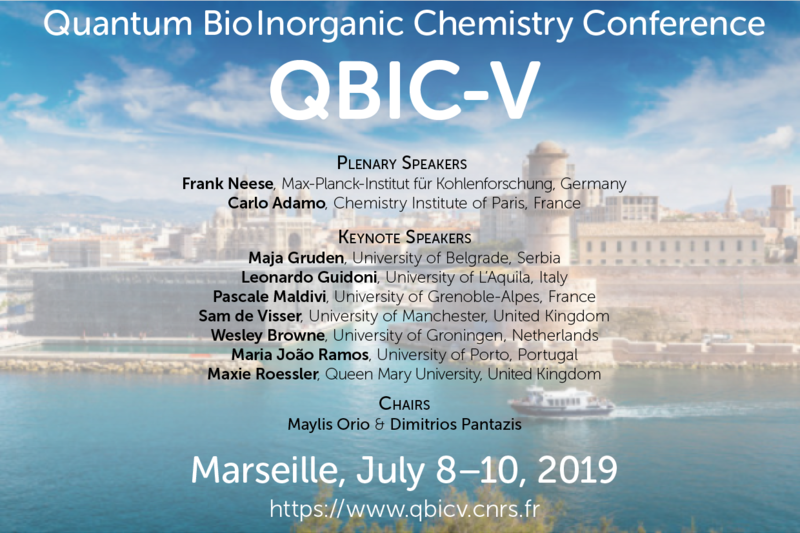 Following on the highly popular series of QBIC meetings in Warwick (1999), Lund (2003), Český Krumlov (2011) and Bath (2018), the fifth Quantum Bio·Inorganic Chemistry Conference will be held in Marseille, France, on July 8-10, 2019. As with previous meetings, QBIC-V covers a wide range of topics in computational inorganic and bioinorganic chemistry, ranging from development of novel theoretical methods to cutting edge applications. Young scientists are particularly encouraged to participate. 6th Computational Molecular Science Meeting: March 27–29 2019, University of Warwick, UK. 12th International Hydrogenase Conference: March 31 – April 4 2019, Lisbon, Portugal. Inorganic Reaction Mechanisms - Inorganic Biochemistry joint Discussion Group: April 15–17 2019, Manchester, UK. 15th International Symposium on Applied Bioinorganic Chemistry: June 2–5 2019, Nara, Japan. 9th Molecular Quantum Mechanics Conference: June 30 – July 5 2019, Heidelberg, Germany. 19th International Conference on Biological Inorganic Chemistry: August 11–16 2019, Interlaken, Switzerland. 17th Central European Symposium on Theoretical Chemistry: September 9-12 2019, Stadtschlaining, Austria. Electronic Structure and Spectroscopy of Transition Metal Complexes (Summer School): September 29 – October 4 2019, Gelsenkirchen, Germany.